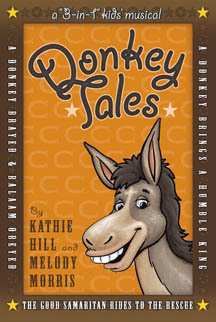 Donkey Tales Thanksgiving/Easter/Year-Round : Kathie Hill Music, LLC, Making music with and for kids for over 25 years! In this follow-up to their best-seller Fish Tales, Kathie Hill and Melody Morris share the stories of Balaam’s donkey, the Good Samaritan, and Jesus riding into Jerusalem. Through these Donkey Tales, children will learn about the obedience God requires, the love we can show our neighbors and the humility that led Jesus to the cross. Kids will love the “Tex’s Dude Ranch” setting where they help owner Tex Arkana tell her Donkey Tales to the accompaniment of the Ranch Hand Band. The country, western swing, bluegrass and rockabilly styles will enhance the setting and energize your choir while the “storybook” format allows for multiple narrators and simple drama. Best of all, Donkey Tales can be presented in full or as minimusicals of four to five songs each. So quit horsing around . . . order Donkey Tales today! Donkey Tales was a great success! Two 12- year olds shared the story telling as Tex Arkana and Tex Longhorn. The choreography and signing added to the performance and gave the older kids a greater roll. Thank you and Melody for such an anointed, entertaining, beautiful work! The kids LOVED Donkey Tales! I have a special needs child and she was so excited to be able to participate. Even my kindergarteners could learn (several songs) & performed for 15 minutes. They were perfect for my kids. My 3-5th graders performed "A Donkey Brings a Humble King" for Easter and the kids loved it. We used the palms, bandanas and many of the motions from the DVD. The kids loved singing and dancing in country western style. Split/Stereo jewel cased CD with spilt left channel instrumentation/right channel choral vocals and stereo instrumentation only. (No dialogue or solos.). Downloadable 3x licensed PDF of all songs, script, production notes & piano transcriptions (up to 103 pgs) with permission to make 3 copies . Additional copies require purchase of additional 3x license/s. Set of 10 paper sleeved CDs of complete musical with all song and dialogue.